Well, here we are, our last day on the island. I apologize in advance if the video quality is a little poor in a few areas. Sawyer and Jack make their way to the Orchid, where they find Hurley and Locke. On the freighter Desmond delivers the grim news that the bomb is set up to be remotely detonated, and can't be disabled. Keamy takes Ben back to the helicopter, but they're ambushed by the Others and taken out. Well, except for Keamy. He gets into a fight with Sayid, and is eventually shot by Richard. Sayid and Kate head to the helicopter, while Ben heads back to the Orchid to move the island. Locke and Jack have their final conversation on the island, and Locke tries to get Jack to stay on the island, that it's his destiny. Jack refuses, and Locke and Ben head down to the Orchid to move the island. 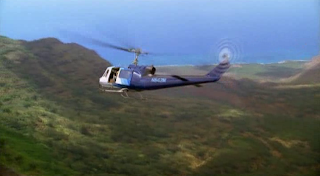 Jack, Sawyer and Hurley head to the helicopter to get off the island. We discover Keamy's not actually dead, and he's found his way down to the Orchid to get Ben. He tells Ben about his heart monitor that is connected to the bomb on the freighter. But Ben takes him down and stabs him in the neck anyways. The bomb doesn't go off, because Michael has been freezing the wires with liquid nitrogen, but once it wears off, boom. The helicopter leaves the island, but it's leaking fuel, and they don't have enough to get back to the freighter. So Sawyer tells Kate good-bye and jumps off to lighten the load on the helicopter. As soon as it lands on the freighter, Desmond tells them about the bomb. They refuel as quickly as possible so that they can get off the freighter. The helicopter leaves before Jin can get onboard, but before they can do anything, the bomb explodes, and the freighter blows up. Sawyer swims back to the island, and Juliet shows him the large plume of smoke from where the freighter used to be. Ben heads to the heart of the island to go and move it, and says good-bye to Locke, and wishes him well in his future on the island. He heads down, finds the donkey wheel, and turns it. The island begins to make a humming noise, the sky flashes white, and the island disappears. With nowhere to land, the helicopter crash lands in the ocean. They set up an emergency raft, and float in the ocean, trying to figure out what to do. That night, a boat finds them and rescues them. It turns out to be Penny's boat, and she and Desmond are reunited. The episode runs 60:44 and is 511MB to download. You can stream the episode below (via Facebook), or go here to use torrents (better quality, recommended) to download the episodes to your computer.